The following is from Omnipotent Government by Ludwig von Mises, 1944, re-published by the Ludwig von Mises Institute. It is subsection 5 of Chapter VIII, Anti-Semitism and Racism: Anti-Semitism as a Factor in International Politics. It was a very strange constellation of political forces that turned anti-Semitism into an important factor in world affairs. In the years after the first World War Marxism swept triumphantly over the Anglo-Saxon countries. Public opinion in Great Britain came under the spell of the neo-Marxian doctrines on imperialism, according to which wars are fought only for the sake of the selfish class interests of capital. The intellectuals and the parties of the Left felt rather ashamed of England’s participation in the World War. They were convinced that it was both morally unfair and politically unwise to oblige Germany to pay reparations and to restrict its armaments. They were firmly resolved never again to let Great Britain fight a war. They purposely shut their eyes to every unpleasant fact that could weaken their naïve confidence in the omnipotence of the League of Nations. They overrated the efficacy of sanctions and of such measures as outlawing war by the Briand-Kellogg Pact. They favored for their country a policy of disarmament which rendered the British Empire almost defenseless within a world indefatigably preparing for new wars. But at the same time the same people were asking the British government and the League to check the aspirations of the “dynamic” powers and to safeguard with every means—short of war—the independence of the weaker nations. They indulged in strong language against Japan and against Italy; but they practically encouraged, by their opposition to armaments and their unconditional pacifism, the imperialistic policies of these countries. They were instrumental in Great Britain’s rejecting Secretary Stimson’s proposals to stop Japan’s expansion in China. They frustrated the Hoare-Laval plan, which would have left at least a part of Abyssinia independent; but they did not lift a finger when Italy occupied the whole country. They did not change their policy when Hitler seized power and immediately began to prepare for the wars which were meant to make Germany paramount first on the European continent and later in the whole world. Theirs was an ostrich policy in the face of the most serious situation that Britain ever had to encounter. The problem which Great Britain had to face was simply this: is it in the interest of the nation to permit Germany to conquer the whole European continent? It was Hitler’s great plan to keep England neutral at all costs, until the conquest of France, Poland, Czechoslovakia, and the Ukraine should be completed. Should Great Britain render him this service? Whoever answered this question in the negative must not talk but act. But the British politicians buried their heads in the sand. Given the state of British public opinion, France should have understood that it was isolated and must meet the Nazi danger by itself. The French know little about the German mentality and German political conditions. Yet when Hitler seized power every French politician should have realized that the main point in his plans was the annihilation of France. Of course the French parties of the Left shared the prejudices, illusions, and errors of the British Left. But there was in France an influential nationalist group which had always mistrusted Germany and favored an energetic anti-German policy. If the French nationalists in 1933 and the years following had seriously advocated measures to prevent German rearmament, they would have had the support of the whole nation with the exception of the intransigent communists. Germany had already started to rearm under the Weimar Republic. Nevertheless in 1933 it was not ready for a war with France, nor for some years thereafter. It would have been forced either to yield to a French threat or to wage a war without prospect of success. At that time it was still possible to stop the Nazis with threats. And even had war resulted, France would have been strong enough to win. But then something amazing and unexpected happened. Those nationalists who for more than sixty years had been fanatically anti-German, who had scorned everything German, and who had always demanded an energetic policy against the Weimar Republic changed their minds overnight. Those who had disparaged as Jewish all endeavors to improve Franco-German relations, who had attacked as Jewish machinations the Dawes and Young plans and the Locarno agreement, and who had held the League suspect as a Jewish institution suddenly began to sympathize with the Nazis. They refused to recognize the fact that Hitler was eager to destroy France once and for all. Hitler, they hinted, is less a foe of France than of the Jews; as an old warrior he sympathizes with his French fellow warriors. They belittled German rearmament. Besides, they said, Hitler rearms only in order to fight Jewish Bolshevism. Nazism is Europe’s shield against the assault of World Jewry and its foremost representative, Bolshevism. The Jews are eager to push France into a war against the Nazis. But France is wise enough not to pull any chestnuts out of the fire for the Jews. France will not bleed for the Jews. It was not the first time in French history that the nationalists put their anti-Semitism above their French patriotism. In the Dreyfus Affair they fought vigorously in order to let a treacherous officer quietly evade punishment while an innocent Jew languished in prison. It has been said that the Nazis corrupted the French nationalists. Perhaps some French politicians really took bribes. But politically this was of little importance. The Reich would have wasted its funds. The anti Semitic newspapers and periodicals had a wide circulation; they did not need German subsidies. Hitler left the League; he annulled the disarmament clauses of the Treaty of Versailles; he occupied the demilitarized zone on the Rhine; he stirred anti-French tendencies in North Africa. The French nationalists for the most part criticized these acts only in order to put all the blame on their political adversaries in France: it was they who were guilty, because they had adopted a hostile attitude toward Nazism. Then Hitler invaded Austria. Seven years earlier France had vigorously opposed the plan of an Austro German customs union. But now the French Government hurried to recognize the violent annexation of Austria. At Munich—in coöperation with Great Britain and Italy—it forced Czechoslovakia to yield to the German claims. All this met with the approval of the majority of the French nationalists. When Mussolini, instigated by Hitler, proclaimed the Italian aspirations for Savoy, Nice, Corsica, and Tunis, the nationalists’ objections were ventured timidly. No Demosthenes rose to warn the nation against Philip [of Macedon]. But if a new Demosthenes had presented himself the nationalists would have denounced him as the son of a rabbi or a nephew of Rothschild. Germany openly prepared a war for the total annihilation of France. There was no doubt about the intentions of the Nazis. Under such conditions the only policy appropriate would have been to frustrate Hitler’s plans at all costs. Whoever dragged in the Jews in discussing Franco-German relations forsook the cause of his nation. Whether Hitler was a friend or foe of the Jews was irrelevant. The existence of France was at stake. This alone had to be considered, not the desire of French shopkeepers or doctors to get rid of their Jewish competitors. That France did not block Hitler’s endeavors in time, that it long neglected its military preparations, and that finally, when war could no longer be avoided, it was not ready to fight was the fault of anti-Semitism. The French anti-Semites served Hitler well. Without them the new war might have been avoided, or at least fought under much more favorable conditions. When war came, it was stigmatized by the French Right as a war for the sake of the Jews and by the French communists as a war for the sake of capitalism. The unpopularity of the war paralyzed the hands of the military chiefs. It slowed down work in the armament factories. … Thus the unbelievable happened: France disavowed its past, branded the proudest memories of its history Jewish, and hailed the loss of its political independence as a national revolution and a regeneration of its true spirit. Not alone in France but the world over anti-Semitism made propaganda for Nazism. Such was the detrimental effect of interventionism and its tendencies toward discrimination that a good many people became unable to appreciate problems of foreign policy from any viewpoint but that of their appetite for discrimination against successful competitors. The hope of being delivered from a Jewish competitor fascinated them while they forgot everything else, their nation’s independence, freedom, religion, civilization. … The secret weapon of Hitler is the anti Jewish inclinations of many millions of shopkeepers and grocers, of doctors and lawyers, professors and writers. The present war would never have originated but for anti¬Semitism. Only anti-Semitism made it possible for the Nazis to restore the German people’s faith in the invincibility of its armed forces, and thus to drive Germany again into the policy of aggression and the struggle for hegemony. Only the anti-Semitic entanglement of a good deal of French public opinion prevented France from stopping Hitler when he could still be stopped without war. And it was anti-Semitism that helped the German armies find in every European country men ready to open the doors to them. Mankind has paid a high price indeed for anti-Semitism. The Obama administration knows this. They simply don’t care. Their position is clear: America’s ally, Israel, is no longer valuable. Sacrificing it in order to win Obama global popularity points is a worthwhile pursuit. The Obama administration offers Israel a choice between being a victim of suicide via territorial concessions to the Palestinian Arabs, or a victim of homicide via Iran. 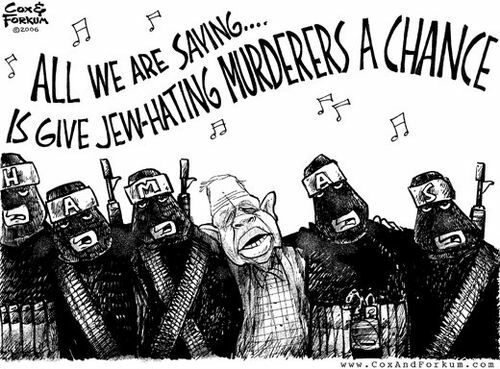 And the Obama administration forces that choice so that Obama can smile and wave at cheering throngs of Jew-hating maniacs who populate the Muslim world. Obama’s defenders no doubt scoff at such accusations. Obama, the Man of Tolerance, an anti-Semite? Obama is concerned when a Muslim state [Pakistan] populated by radical Muslim sympathizers makes territorial concessions to those radical Muslim sympathizers. He is concerned that those Muslim terrorists will be within 100 miles of a Muslim capital. And he is worried that Muslim terrorist attacks on Muslims will escalate. Yet Obama advocates for territorial concessions by Jews to radical Muslims. He presses Jews to hand over territory not 100 miles from the capital, but constituting half the capital itself. He knows that each time Israel has made territorial concessions, Muslim terrorists have upped the ante — most recently in both Lebanon and the Gaza Strip. And he knows that the Palestinian Arabs have never and will never lay down their arms. Yet he threatens Israel with allowing its nuclear annihilation if Israel refuses to authorize euthanasia. No one seems to find it odd that that Pakistani Muslim terrorists who hate India and want it to give up control of Indian Kashmir would send two of its 10 terrorists to kill perhaps the only rabbi in Mumbai. As Newsweek reported during the siege, Given that Orthodox Jews were being held at gunpoint by mujahideen (sic), it seemed unlikely there would be survivors. Newsweek, like just about everyone else, simply assumes Islamists will murder Jews whenever and wherever possible. It is exquisitely fitting that the same week the murders in Mumbai were taking place, the United Nations General Assembly passed six more anti-Israel resolutions. As it has for decades, the U.N. has again sanctioned hatred for a good and decent country as small on the map of the world as the Chabad House is on the map of Mumbai. Muslims have killed more Americans than any group or state since the end of the Vietnam War. Yet, in an unflagging effort to reassure Muslims we were continually told that these terrorists “hijacked a great religion” and those who use it for violent ends are engaged in a “perversion” of the faith. Even seemingly honorable defenders of the faith have masqueraded as moderates until they were apprehended for conspiring to aid or fund jihad and al Qaeda through communal or charitable organizations. There are over 200 documented episodes where the “perverters” of the faith have been apprehended and thwarted in deadly plans right here in the United States. The charges all range from financing Islamic terrorism, obstructing justice by refusing to testify or by aiding terrorist wannabes, to stockpiling and transporting explosives and weapons, attempting to bomb airlines and military bases, providing false tips to federal law enforcement, assault and murder of family members who dishonor the family, smuggling false passports, committing arson and conspiring to kill and maim civilians. There are probably an equal number of “sleeper cells” which have been discovered and thwarted but an unsettling number which continue to operate and plot under the radar of law enforcement. Is it irrational or bigoted to fear them? No. It’s prudent. We should we demand that our elected legislators consider our safety and homeland security and confront and condemn putative terrorists and those who aid and abet them instead of pandering to the whining and pretended “victimhood” of those who would destroy us. I am afraid for our country. I fear creeping Sharia, and it is high time for the purported great majority of peaceful Muslims to speak out loudly and forcefully against fanatical hatred of Jews and Christians and to denounce violence and terrorism and dreams of a global Caliphate. Finally, is it not perverse to trivialize the historic shame and curse of anti-Semitism by linking it to the calculated whims and deceptions of those who practice, preach and promote Jew hatred and genocide?